PULASKI COUNTY, Mo. (Oct. 30, 2015) — Committee of Fifty members honored Marine Sgt. Carl W. Weiffenbach Friday, who was recently promoted to that rank and earlier this year was named Fort Leonard Wood’s Joint Service Junior Enlisted Member of the Year during March’s Best Warrior Competition. Bigelow noted that Weiffenbach only recently enlisted in the Marines, doing so in May 2013, and said it’s tough to make the rank of sergeant only two years after enlisting. “He is really the epitome of what we want a Marine sergeant to be,” Bigelow said. 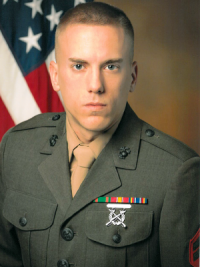 According to Weiffenbach’s official biography, he was born in 1988, graduated from Bexley High School in Ohio in 2006, and enlisted in the Marines seven years later. He’s trained as an automotive maintenance technician and received three promotions in two years, a meritorious promotion in boot camp to private first class, a promotion while still in automotive technical training to lance corporal, and after reporting to Fort Leonard Wood’s Marine Corps Detachment in March 2014, was promoted to corporal in November 2014. Committee of Fifty President Rick Morris concurred with Bigelow’s evaluation of Weiffenbach’s accomplishments. “To be selected and beat all the other competition for the entire year... we know that is absolutely significant,” Morris said. Morris cautioned Weiffenbach that promotion carries greater and greater responsibility with the rank. As people progress in the ranks, they learn that far from being able to “kick back” at higher ranks, time “becomes more precious,” Morris said.